The Nazis' Last Victims articulates and historically scrutinizes both the uniqueness and the universality of the Holocaust in Hungary, a topic often minimized in general works on the Holocaust. 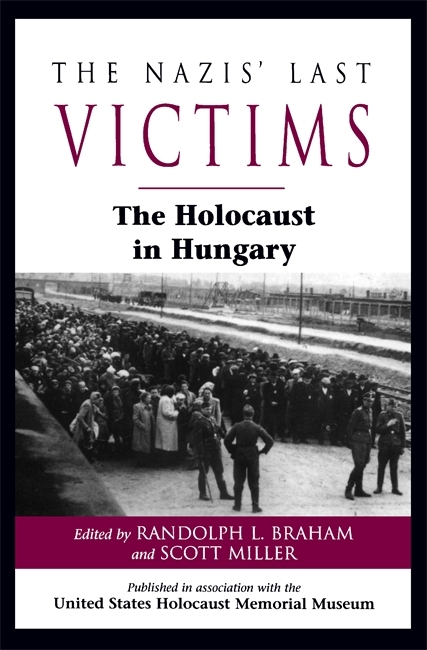 The result of the 1994 conference at the United States Holocaust Memorial Museum on the fiftieth anniversary of the deportation of Hungarian Jewry, this anthology examines the effects on Hungary as the last country to be invaded by the Germans. The Nazis' Last Victims questions what Hungarians knew of their impending fate and examines the heightened sense of tension and haunting drama in Hungary, where the largest single killing process of the Holocaust period occurred in the shortest amount of time. Through the combination of two vital components of history writing—the analytical and the recollective—The Nazis' Last Victims probes the destruction of the last remnant of European Jewry in the Holocaust. Randolph L. Braham is the director of the Rosenthal Institute for Holocaust Studies at the Graduate Center of the City University of New York. Scott Miller is director of the Benjamin and Vladka Meed Registry of Jewish Holocaust Survivors at the United States Holocaust Memorial Museum. An exciting and most interesting complex report and analysis on the most hideous episode of the most systematic genocide of human history. Professor Randolf Braham, the best expert of the topic and his co-editor and co-authors accomplished an excellent work." To commemorate the fiftieth anniversary of the Holocaust in Hungary, an international scholar's conference was held in Washington, DC under the auspices of the United States Holocaust Museum. Nine of the contributed essays are contained in [The Nazis' Last Victims]. Randolph L. Braham gives a scholarly and well-nuanced survey of the history of the Jews in Hungary from the Compromise of 1867 to the present. . . . The book is an excellent source on the Shoah and on a dark chapter in the eleven hundred year history of Hungary.